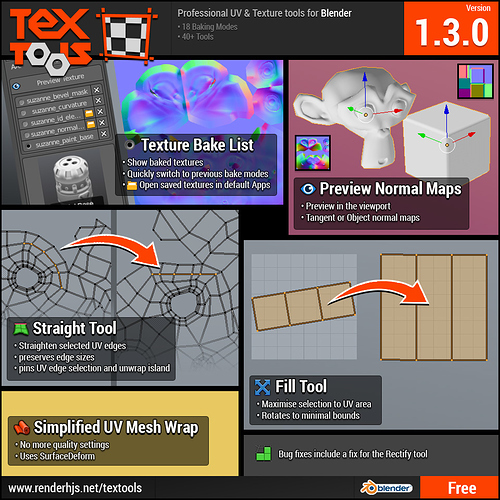 TexTools is a free addon for Blender with a collection of professional UV and Texture related tools. Back in 2009 I released the Original TexTools for 3dsMax. This is my first blender addon, more features will be added in the future. 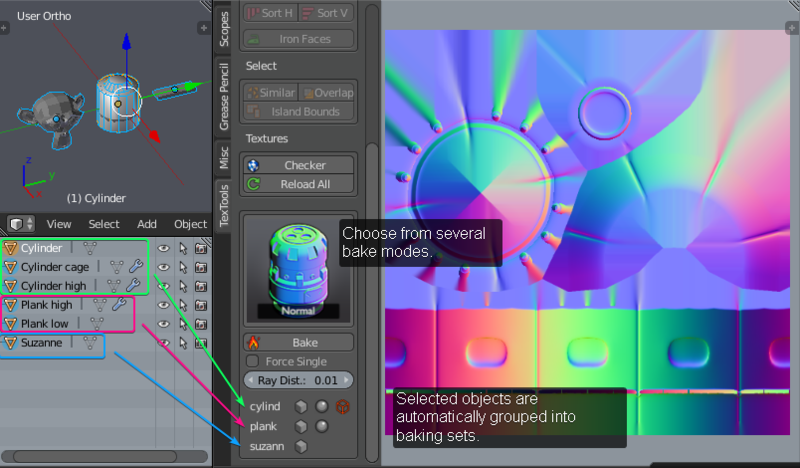 Bake: Select object and press bake: That easy! 18 bake modes: AO, ID map, normal, cavity, worn, gradient Z. And more to come. Automatically group objects by matching names. Quickly assign sizes in pixels for baking or related tools. Selects similar UV islands based on the UV island input selection and matching UV Island topology. Bake explode tool: Moves bake object sets apart so its easier to create clean bakes. How can I unwrap UV and have the results automatically match the scale of my texture? I have such fond memories of this addon, back when I was using max. I couldn’t conceive working in max’s uv editor without this toolset. So let me first do something I never did back then - thank you for your work! Secondly, welcome! I hope you’re enjoying blender as much as we are. I don’t know if you’re still using max, I personally stopped using it some years ago and never looked back, but I’m sure blender will win you over completely, if it hasn’t already. We have some other great uv editor toolsets in development on these forums (check out Nutti’s Magic UV, if you haven’t) and seeing yours here is great news. Your addon certainly has some unique and very useful features. Wow some nice Uv Tools! Thank you! Can we except the other tolls that are in textools in MAx? I dont find the " mirror tool " that showed in manual in panel . Do i miss some steps to make it visible ? My Textools is 0.3.0! Big thanks you Textools . I’m still using TexTools for 3ds max 2014. Thank you for that tool. And I could not believe that TexTools would appear for Blender. This is the best gift for the New Year. Will you create something like similar tools for 3ds max TexTools? Or we can expect from you create other additional tools that are not in Blender? You use icon + text, I think it’s good solution. yes there are still many 3D artists out there using TexTools for their daily work in 3dsMax. Yes I do enjoy blender once I forced myself to finally learn it seriously .For me back then TexTools and maxscript was always something I can take with me as I always had 3dsmax available to me (uni, work, home,…). Having a drag and drop script that doesn’t require admin rights and installs very quickly was a very important expierence to me. Blender steps this up a bit, at my current work Blender allows me to just take it to work and just use it in the pipeline process because its free and multi platform. Creating pipelines and integrating tools or people is what I am passionate about. This is where TexTools comes in again: Having it free and quick to install / use is important to me. Yes I have seen pretty much everything that’s out there addon wise for blender and UV’s. I personally use ‘Multi Object UV Editing’ and ‘UV Squares’ but most of the addons out there are simple or not context sensitive. I need more of a suite. Also I am very picky when it comes to UI and expierence. And a whole new set of baking modes with a 1 click solution (no setup, configs,…). Simply select your objects and low, high and cage objects are automatically detected. Regarding the mirror Tool: That’s because it is very buggy at the moment. I will enable it in the UI when it is more stable. I will defenitly transfer many tools and ideas, but not all of them make sense for Blender. Others like the baking modes I would like to improve and refine. Currently I planned: AO, Cavity, Dust, gradient Z, ID, Normal and Worn. The idea is to keep them as few simple ideas and then tweak and improve each shader over time. Currently in the code I actually load a material from a nested blend file in the plugin folder, this makes it very easy to tweak and adjust the shaders over time and with each release. Thank you very much for making this, I’ve been waiting for it since you announced it will be coming to blender! Could this be possible to add in textool? It color codes all islands with their current status (flipped, overlapped, etc) super useful imo. Wow, that’s just gorgeous news! Mostly, that was incredible way for quad retopology, that still uses to fill complex surfaces with patterns. = Smart UV. Makes workflow. = UV Squares. Makes it squared. = Magic UV. Makes some magic. = UV Align/Distribute. Mostly Alignes. = Texel Density Checker. Makes sure. = UDIM support concept. Looking nice. = Sure UV map, that was rewritten and places to 1D_Scripts in Integrated addons section. So, thank you so much for bringing live legend to us! Great! Fantastic news for every Blender user. SOOOO nice to see you here!!! For your first addon in Blender, you sure put the bar quite high. Nicely done, amazing addon. Thank you for sharing ! Thanks for the warm welcome, Blender has indeed an awesome community! I actually made much quicker progress with the baking tools and I am happy to release the next update. There are a few bugs that I am aware of right now such as the Checkermap script only working in the ‘Blender Render’ mode. They will be fixed in time. 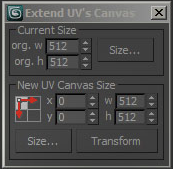 Setup baking and padding size in pixels as well as padding space for several UV tools in TexTools. Just select objects and press Bake! Under the hood it automatically groups your object selection by common names and object type prefixes such as ‘low’, ‘lowpoly’, ‘high’ or ‘cage’ but it also checks for subdevision modifiers for example to determine high poly objects. It previews all of these sets in realtime in the inspector so you always know how many low poly, high poly or cage objects you have in a set. But you can also force all selected objects to be baked into a single texture (no clear texture), which is great for exploded bake setups. Read the documentation for more detailed information on how names are split etc. or select individual objects and see their object type in the TexTools inspector. Covering the new baking tools in more depth as well as developer notes for running the source version of TexTools or enabling the developer mode in TexTools. When I have some more time tomorrow or the weekend I will upload a video to demo the current features of TexTools for Blender. @fiendish55: Regarding displays for flipped UV’s and overlapping ones: I noticed that Nutti already implemented the other day something like that for Magic UV. Personally I don’t like starting a mode in order to run in realtime a overlay in the UV editor. I am thinking instead of having tools to select flipped faces instead, just like the select overlapping islands as it will feel more natural inside Blender. @1D_Inc: Thank you for your generous donation from the other day!, that made my day. Yeah the UV to XYZ swap was very nice and unique. It was a lot easier in 3dsMax because of the way 3dsMax handles the buffers for the vertex, face, uv,… data, you could literally swap them around. In Blender there are now UVW coordinates, but just UV. There are also some other challenges in Blender which is why the swap UVW to XYZ is not yet done. I was also thinking of using shape keys to transition back and forth but still have to brain storm for some other ideas to store the missing data in the UV. Yeah I am aware of most of the other tools out there: Been looking a lot at their code and learning from them. Some texel density tools will come in the future to TexTools for sure. And yes the donate button still works, I added the donate link to the README.md and the addon itself so thanks for reminding me. @dsimovski: Thanks, yeah still used it this year at my previous work place. Mostly showing other 3D artists how to speed up their workflow with UV and texturing. @didli: Thanks, I actually started learning Blender about 3 months ago. At my current work I started some of my first python scripts in Blender: Exporting tools and pipeline for the Unity game engine. Luckily there are already some great open UV scripts out there where I could learn from. so3Datel: I have noticed that the normal baking is broken with the nightly builds. Test the official 2.79, it works for me.